Hey! Kool-Aid! You know the drill. And then the obese pantless freak comes smashing through walls and doors, eager to cannibalize himself by serving up some of his insides. What in the what, now? And who has to pay for those walls he busted down? Not him, I'm guessing. Kool-Aid Man was both ingenius and incredibly creepy. We remember him to this day, but we're never quite sure if it would be a good or a bad thing to have the giant pitcher with elephant stumps for legs come running to provide beverages for your childhood sweaty activities. Kool-Aid Man visits "Family Guy"
It was Kevin's nickname on "The Office"
This is more along the lines of the ads I remember. Kool-Aid Man also was an Atari and Intellivision game. Reportedly voted the stupidest game of 1983. There are some kind of creepy parodies of the ads. 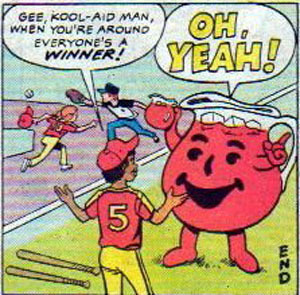 But maybe we should be thankful -- before the Kool-Aid Man could walk, he was just a stupid pitcher with a face that talked to some very white 1950s kids who had no sense of musical pitch. What's your memory of Kool-Aid Man -- cute or creepy? Did you drink the stuff? Kool-Aid was pretty much all my sister and I were allowed to drink as kids (no actual soda and water? What's that? Milk was for meals). I absolutely remember that "wacky wild Kool-Aid style" commercial. I think the Kool-Aid changed colors or something. I never had an opinion of the Kool-Aid man growing up; he was just there. A mainstay of my childhood. I loved going to the grocery store with my dad and picking out the Kool-Aid flavors. Raspberry and black cherry were my favorites. I'm with the Pinch. Kool-Aid Man certainly wasn't cute, and he WAS KINDA creepy, but having grown up on Sid & Marty Croft and the '70s in general, nothing was all THAT creepy.